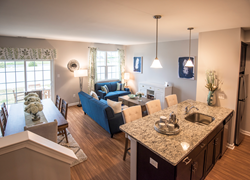 The Enclave at Winslow, a rental townhome community in Winslow Township, has been named Community of the Year at the 2017 MAME Awards, presented by the Builders Association of South Jersey. Located on a private street across from Winslow Township Elementary 4, The Enclave at Winslow includes a 36-acre setting that features expansive green space and preserved woodlands with walking trails. Kali Road 105, LLC, Alliance Homes, LLC. and Harvestate Group, LLC. were honored at the Builders League of South Jersey’s 2017 MAME Awards held earlier this month for their achievements in marketing excellence at their newest rental community, The Enclave at Winslow. Those interested are encouraged to stop by for a tour of the community’s new, fully furnished model. The Enclave at Winslow is located at 540 Kali Road in Winslow Township, NJ (GPS: 540 Kali Road, Sicklerville). To learn more, visit http://www.EnclaveAtWinslow.com.